The porcelain eggs in the photo above replicate those of real birds and are part of an exhibition called Natural Selection, which is on at the Towner Gallery in Eastbourne at the moment. 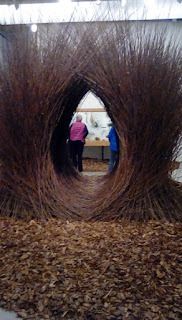 The first half of the exhibition is about the building of nests. Using videos, works of art and a massive reproduction of the stage that bower birds build for courtship displays, it shows the wide variety of designs created by birds. Many of these have evolved for practical reasons, but some – such as the courtship bower – appear to be more for aesthetics akin to human concepts of art. The second half of Natural Selection looks at egg collecting. Back at the end of the 19th century this was mainly done for scientific study, but in the early 20th century it became a popular pastime with everyone from amateur naturalists to children. The serious toll egg collecting was having on bird populations led to it being made illegal in 1954. Yet despite huge efforts by the RSPB to protect endangered species’ nests, criminal collecting still happens. A video looks at changing attitudes to egg collecting over the past 150 years. 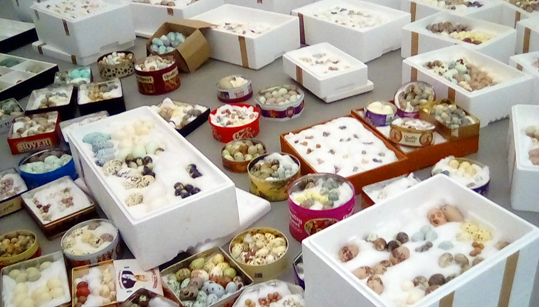 The porcelain eggs in the picture above highlight the huge numbers of eggs that illegal collectors can take. They are both fascinating and deliberately shocking at the same time. Few can deny the natural beauty of eggs, but taking them from breeding birds is surely selfishness in the extreme. The exhibition is a collaboration between artist Andy Holden and his father, ornithologist Peter Holden. He previously worked on the TV series Bird in the Nest with Bill Oddie, which was a forerunner to Spring Watch. Once you have eaten all your chocolate eggs this Easter, if you are near Eastbourne in Sussex, do go along to this free exhibition at the Towner and learn more about the real thing.